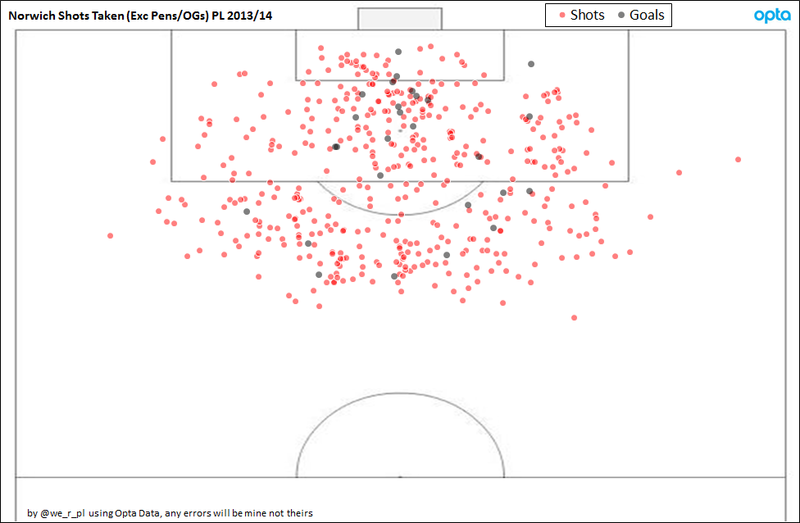 Before the World Cup I wrote a quick post on Shot Segmentation with the aim to classify the 10,000 or so shots taken during the 2013/14 season into a smaller number of groups to try and quantify the 'quality' of opportunities each side has (and concedes). 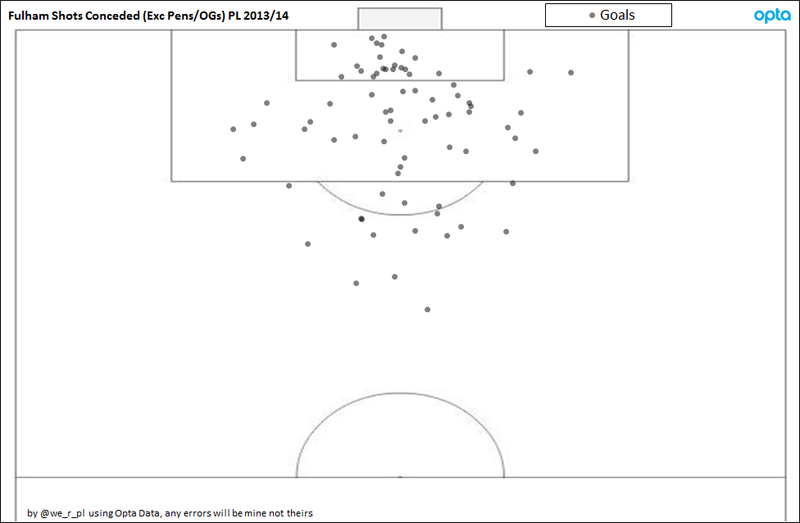 The full background is here, but basically is a case of using a mix of Opta's big chance metric to get beyond just using location data, combined with location and shot type (e.g., was the attempt a header). 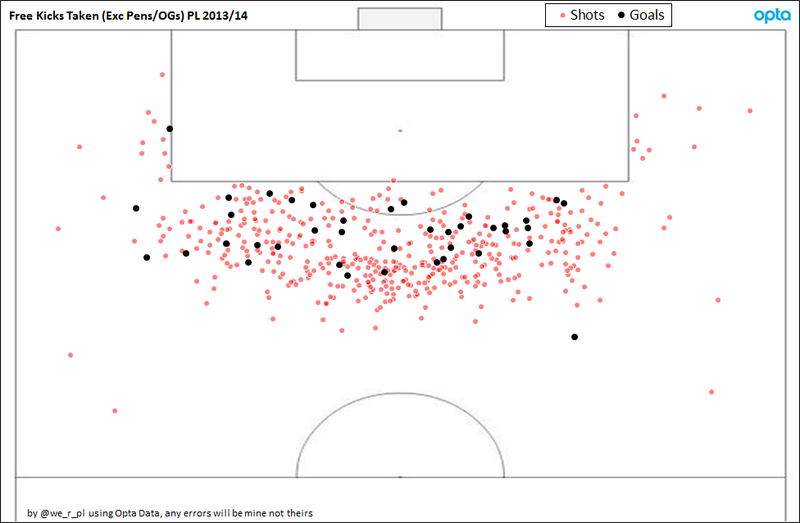 It's not as good as having the full video of every shot but is an improvement on just knowing shot volume. None of the above is perfect, some of the splits are arbitrary and there will be some chances that are on the boundary of two groups where a slight change in location could change it from being a 'Good' to an 'OK' chance. 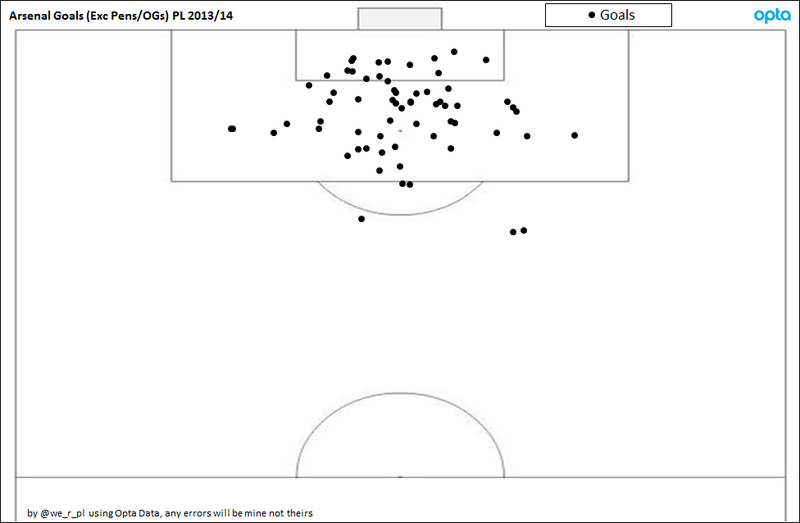 The aim for now though is to get a rough feel of the type of chances teams are creating. 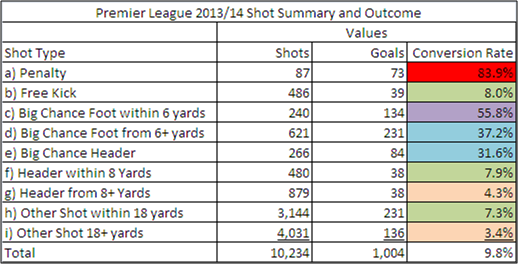 With a bit more data (and a bit more time), I'd expect what goes in to these groupings to change a bit. 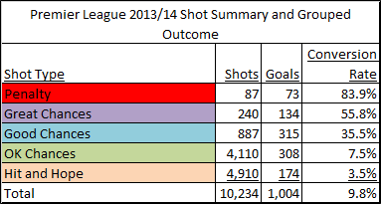 Norwich (& Swansea) scoring only 1 goal from a 'Great Chance' all season. 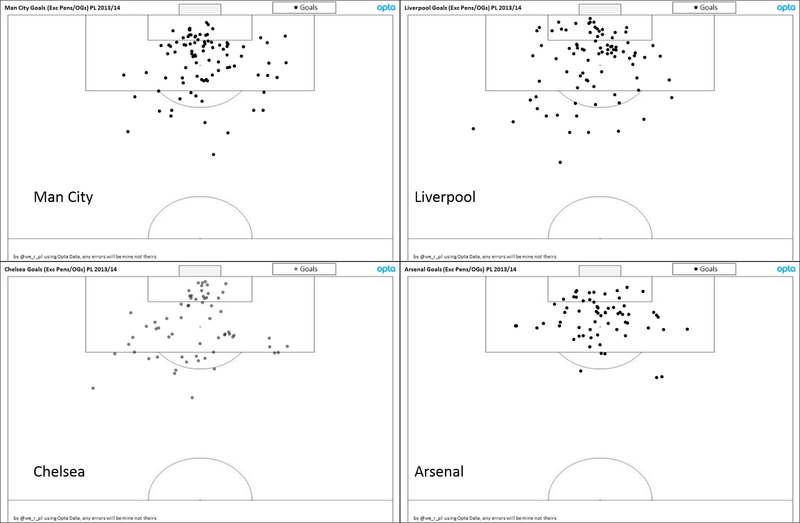 Different teams have different styles and some may lack the close in shots that are the 'Great Chances' but neither created too many of these chances ether (5 and 4 respectively). 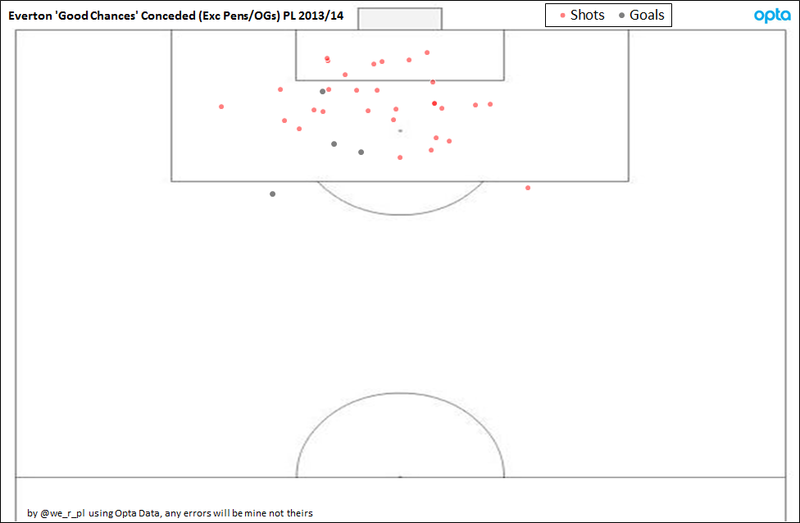 Having this information by match, means we can also turn it on its head and look at the kind of shots a team conceded. Everton had a particularly good season with the question being can it be repeated. 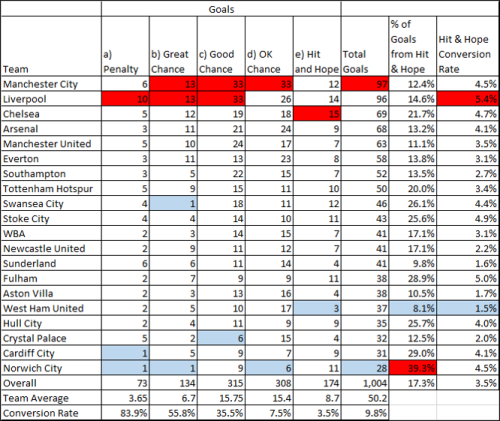 Looking at the 'Good Chances' they conceded (i.e., Big Chance headers along with Big Chance shots from more than 6 yards out), of the 34 they conceded only 4 ended up as goals (where you would expect 12 based on average performance). 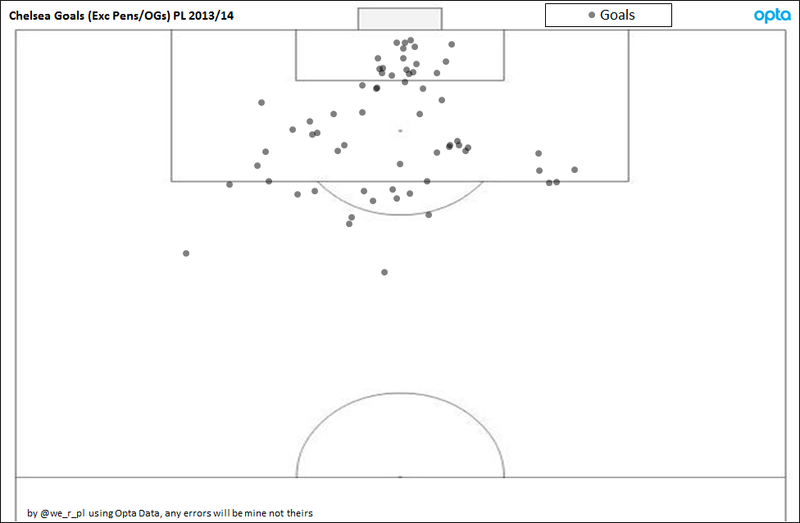 There's always the risk by cutting data too many times you're left with something which just exists by chance, but given Howard's performance v Belgium in the World Cup, it's possible he is above average at stopping these kinds of chances (he saved 12 of the 16 on target - 75% compared to a division average of 43%).